One of my favorite things about being on the quest (painting every national park in America) is the initial search for that ultimate scene. 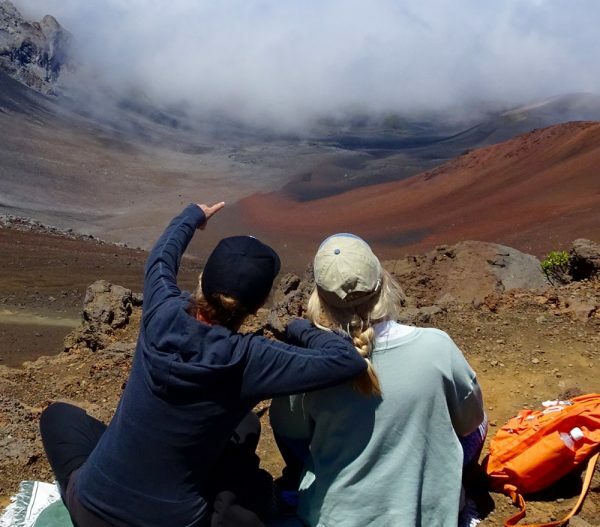 When I first arrived atop Haleakala National Park in Maui it felt thrilling to be on top of the world. 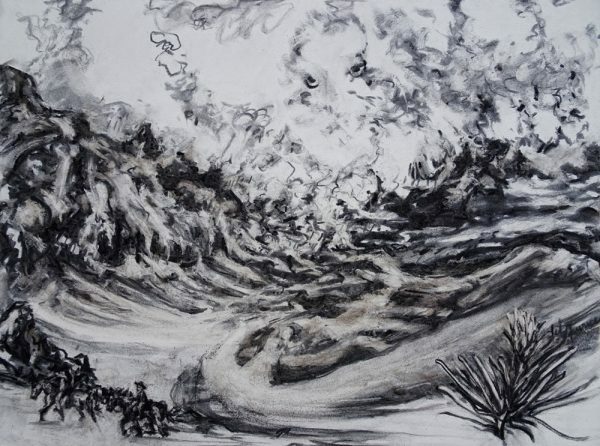 The sketch by Fitz Maurice that will serve as the foundation for her painting of Haleakala National Park. I stood there wobbling, while looking downward forever upon cascading green hills that finally embrace the black lava shores caressed by a tropical sea. The view was breathtaking. I have found that it is always wise to check in with the visitor center before heading out. I like to review my priority list of must-sees with a trusty ranger to make sure the trails I want are open and my goals are attainable given the time of year. Rangers are always happy to give you a weather update and point out any current wildlife or hazardous concerns. There is a lot to consider before you walk into the wilderness and find yourself many miles away from anyone. It’s mandatory to bring enough water and sun protection. I have learned the hard way to evaluate the terrain I will be hiking ahead of time because the appropriate footwear is critical and I’ve learned to keep my hat on. Then I head out as the cowboys say. I start with the highlights of the park. My goal is to capture in paint the iconic image of each national park and reveal the essence of its mysteries the way only art can. When in Haleakala National Park I found the ultimate scene at the top of what is appropriately called Sliding Sands Trail. I perched myself up above Sliding Sands Trails and spied the landscape below for what felt like hours. I didn’t really know what I was waiting for, but knew from experience that when my inner spirit takes a poised position I must perk my ears up and pay close attention to what is happening all around me. Lo and behold my friend Nicki, a native of Maui and an experienced hiker in Haleakala, cried out, “there’s horses out there.” I was so thrilled to watch horses ride right through my chosen scene for the future drawing. What an inspiration to see such nostalgic life pass before that still and sandy landscape. Fitz Maurice with fellow hiker Nicki Armour above Sliding Sands Trail in Haleakala National Park, Maui. As you are looking at the drawing, you will see the landscape from my perspective. I drew it while perched up above looking down into the belly of the crater carved by the volcanic lava flow. Have you found the horses in the drawing? They are there; you’ll have to discover them the way I did, off in the distance and one with all. Did you notice the plant life in the lower right corner of the drawing? That is the rare silversword, which is a volcanic subspecies found only on the Hawaiian Islands. I thought these exotic-looking plants were stunning in their lunar landscape. Their numerous sword-like succulent leaves are covered with silver hairs that reflect the sun’s rays. They can live up to 90 years old, but only bloom once in their lifetime. Once endangered, now I got to witness an abundance of silverswords in various stages of life as I hiked through the park. It is this kind of personal experience and learned information that becomes the code for the composition of the drawing. The Hawaiian natives believed that Pele was the demigoddess of Hawaii and she can be found up in the clouds of the drawing. I was amazed by the clouds and fog that came roaring in that eventually engulfed the entire landscape. Pele actually just appeared as I was drawing the clouds and I decided to let her in. After all she rules the volcanoes of Hawaii! Other images appeared as I was drawing this landscape filled with the contradictions of sliding sand and hard lava rock. The more I drew the more the wonders and spirits of this sacred place emerged. I simply allowed them to reveal themselves in my charcoal drawing. For me as a lifetime artist, the drawing is the culmination of all the elements that filled my senses while there in the midst of its glory. The ultimate scene must call out to me, compelling me to immortalize it as the ideal example of that park’s character. The drawing is also the foundation for the painting to follow. The actual paint and all of its color must hang on the properly constructed foundation of the drawing. Watch for future “Stories from the Woods” and the finished oil painting of Haleakala in the next few weeks. See all the paintings from Fitz Maurice’s Quest at nationalparkpaintings.com. The first exhibition of her National Park Paintings is scheduled for June and July, 2018 at the Hockaday Museum of Art, Kalispell, Montana. Work by the lifetime artist and 30-year south-county resident has been exhibited and collected internationally.